آقابیک, کیوان, رادمهر, کیارش, توانا, حسین. (1397). مروری بر اقدامات ایمنی جهت کاهش تصادفات مربوط به عابرین پیاده. جاده, 26(97), 1-12. کیوان آقابیک; کیارش رادمهر; حسین توانا. "مروری بر اقدامات ایمنی جهت کاهش تصادفات مربوط به عابرین پیاده". جاده, 26, 97, 1397, 1-12. آقابیک, کیوان, رادمهر, کیارش, توانا, حسین. (1397). 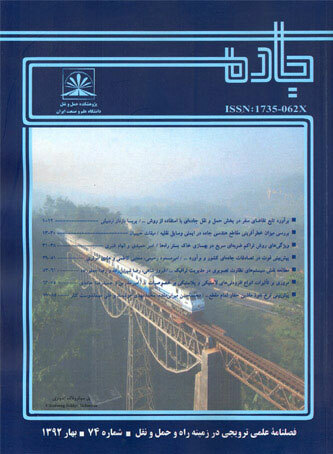 'مروری بر اقدامات ایمنی جهت کاهش تصادفات مربوط به عابرین پیاده', جاده, 26(97), pp. 1-12. آقابیک, کیوان, رادمهر, کیارش, توانا, حسین. مروری بر اقدامات ایمنی جهت کاهش تصادفات مربوط به عابرین پیاده. جاده, 1397; 26(97): 1-12. نقش پیاده‌روی به عنوان یکی از اجزای اصلی حمل و نقل بر هیچ کس پوشیده نیست. این نقش در کلان‌شهرها و به‌ویژه در راستای دستیابی به حمل و نقل پاک و توسعه پایدار شهری بسیار حائز اهمیت است. بعلاوه حضور و آمد و شد عابرین پیاده باعث ایجاد فضای مناسب و ایمن شهری و ارتقاء سطح مراودات و فعالیت‌های فرهنگی و اجتماعی در سطح شهر خواهد بود. لیکن متاسفانه در بسیاری از شهرهای ما، زیرساخت‌ها حمل و نقل با توجه به نیاز خودروها طراحی و اجرا می‌گردند و کمترین توجه معطوف نیاز عابرین پیاده می‌باشد. این غفلت منجر به کاهش پیاده‌روی و حتی کاهش استفاده از حمل و نقل عمومی شده و افزایش استفاده از خودروی شخصی و لذا توسعه شهری خودرو محور را در پی خواهد داشت. بدیهی است در‌ چنین شهرهایی معضلات عدیده بروز خواهند کرد و به‌ویژه مشکلات ایمنی عابرین پیاده در آن‌ها برکسی پوشیده نیست. این پژوهش به جمع‌بندی و شرح اقدامات ممکن برای بهبود زیرساخت‌های شهری و افزایش ایمنی عابرین پیاده می‏پردازد. -قیصر، س.، محمدیان یزدی، پ.، نخعی پور، م. و توجهی، ع.، (1394)­، "ارزیابی رضایتمندی عابرین پیاده استفاده کننده از زیرگذره­های معابر شهری و ارائه راهکارهای افزایش بهره­وری زیرگذرها (مورد مطالعه: شهر تهران، چهارراه ولیعصر (عج))"، چهاردهمین کنفرانس بین المللی مهندسی حمل و نقل و ترافیک، تهران، معاونت و سازمان حمل و نقل ترافیک. - (2001), “American Association of State Highway and Transportation Officials”. A Policy on Geometric Design of Highways and Streets. Washington, D.C.
-Bentzen, B., J. Barlow and L. Franck, (2000), “Addressing Barriers to Blind Pedestrians at Signalized Intersections. ITE Journal, September. -Ben-Bassat, T. and Avnieli, S., (2016), “The effect of a road safety educational program for kindergarten children on their parents’ behavior and knowledge”. Accident Analysis & Prevention, 95, pp.78-85. -Blomberg, R.D., A. Hale and D.F. (1984), “Preusser. Conspicuity for Pedestrians and Bicyclists: Definition of the Problem”, Development and Test of Countermeasures. Report No. DOT HS 806 563. NHTSA. Washington, D.C.
-Blomberg, R.D., D.F. Preusser, A. Hale, and W.A. Leaf. (1983), “Experimental Field Test of Proposed Pedestrian Safety Messages. Highway Traffic Safety Administration, Washington, D.C.
-Bowman, B.L., and R.L. Vecellio. (1994), “Effects of Urban and Suburban Median Types on both Vehicular and Pedestrian Safety”. Transportation Research Record 1445. TRB, National Research Council, Washington, D.C. pp. 169-179. -Britt, J., A. Bergman, and J. Moffat. Law (1995), “Enforcement, Pedestrian Safety, and Driver Compliance with Crosswalk Laws: Evaluation of a Four-Year Campaign in Seattle”. Transportation Research Record 1485. TRB, National Research Council, Washington, D.C.
-Brownfield, D.J. (1980), “Environmental Areas: Interim Report on a Before-After Accident Study”, Traffic Engineering and Control, Vol. 21, No. 5, May. -Campbell, B., C. Zegeer, H. Huang, and M. Cynecki. (2002), “A Review of Pedestrian Safety Research in the U.S. Submitted to Federal Highway Administration. -Carroll, J., and B. Bentzen. “American Council of the Blind Survey of Signalized Intersection Accessibility”. The Braille Forum, Volume 38, 1999, pp. 11-15. -(1986), “Centre D’Études Techniques de l’Equipment de l’Ouest. Evolution de la Sécurité Sur Les Carrefours Giratoires”. Centre D’Etudes Techniques de l’Equipment de l’Ouest, Nantes, France. -City of Cambridge, MA. (2000), “Preliminary Results: Effects of Columbia Street Traffic Calming Project on Driver Behavior. Elvik, R., (2017), “Road safety effects of roundabouts: A meta-analysis”. Accident Analysis & Prevention, No.99, pp.364-371. -(2002), “Federal Highway Administration. Pedestrian Facilities User Guide: Providing Safety and Mobility”. Zegeer, C., C. Seiderman, P. Lagerwey, M. Cynecki, M. Ronkin, and R. Schneider. McLean, VA.
-Ferenchak, N.N. and Marshall, W.E., (2017), “Redefining the child pedestrian safety paradigm: identifying high fatality concentrations in urban areas”. Injury prevention, 23(6), pp.364-369. No. FHWA-RD-76-8, Federal Highway Administration. -Gårder, Per. (1989), “Pedestrian Safety at Traffic Signals. Accident Analysis and Prevention. Vol. 21, No. 5, pp. 435-444. -Gårder, P.E., (2004), “The impact of speed and other variables on pedestrian safety in Maine”. Accident Analysis & Prevention, 36(4), pp.533-542. -Hawley, L., C. Henson, A. Hulse, and R. Brindle, (1992), “Towards Traffic Calming: A Practitioners’ Manual of Implemented Local Area Traffic Management and Black spot Devices”. Publication No. CR 126. Federal Office of Road Safety. Canberra, Australian Capital Territory, Australia. -Huang, H., and C. Zegeer, (2000), “The Effects of Pedestrian Countdown Signals in Lake Buena Vista”. Prepared for the Florida Department of Transportation, November. -Hughes, R., H. Huang, C. Zegeer, and M. Cynecki, (2000), “Evaluation of Automated Pedestrian Detection at Signalized Intersections”. Report No. FHWA-RD-00-097. Federal Highway Administration, McLean, VA.
-(1999), “Institute of Transportation Engineers, Federal Highway Administration. Traffic Calming: State of the Practice. Institute of Transportation Engineers, Washington, D.C., August 1999. -(1997), “Insurance Institute for Highway Safety”. Three-Second Head Start Gives Pedestrians Advantage at Intersections. Status Report, Vol. 32, No. 7, August 30, p.5. -Jacquemart, G. NCHRP Synthesis 264: (1998), “Modern Roundabout Practice in the United States”. National Cooperative Highway Research Program. Synthesis of Highway Practice 264. TRB, National Research Council, Washington, D.C.
-Japan Road Association. (1969), “Accident Prevention Effects of Road Safety Devices: Annual Report. -Knoblauch, R.L., B.H. Tustin, S.A. Smith, and M.T. Pietrucha, (1987), “Investigation of Exposure-Based Pedestrian Accident Areas: Crosswalks, Sidewalks, Local Streets, and Major Arterials”. Report No. FHWA/RD-87-038. Federal Highway Administration, Washington, D.C.
-La Torre, F., (2009), “Positive Effects of Road Surface Discontinuities”. Roadway Surface Discontinuities on Safety, p.25. -Lovemark, O. (1974), “Pedestrians in Town Centers: A Summary of Some Research Projects”. Pedestrian Safety Project Report No. 27, North American Treaty Organization Committee on the Challenge of Modern Society, National Highway Traffic Safety Administration, March. -Macbeth, A. Balliol Street. In Traffic Calming (1995), “Proceedings from 21 papers. Ontario Traffic Conference. November. -McMahon, P.J., A.J. Khattak, C. Duncan, J.R. Stewart, and C.V. Zegeer, (2002), “An Analysis of Factors Contributing to Walking along Roadway” Crashes: Research Study and Guidelines for Sidewalks and Walkways. Report No. FHWA-RD-01-101. Federal Highway Administration. -Moore, R.I., and Older, S.J., (1965), “Pedestrians and Motorists are Compatible in Today’s World”. Traffic Engineering, Institute of Transportation Engineers, Washington, D.C.
-(2017), “National Center for Statistics and Analysis. Pedestrians,” Data (Traffic Safety Facts. Report No. DOT HS 812 375). Washington, D.C. National Highway Traffic Safety Administration. -Nee, J., and M.E Hallenbeck, (2003), “A Motorist and Pedestrian Behavioral Analysis Relating to Pedestrian Safety Improvements. Final Report”. Research Project T1803, Task 16 Pedestrian Safety Prepared for the Washington State Transportation Commission by the Washington State Transportation Center. -Owens, D.A., R.J. (1994), “Antonoff, and E.L. Francis. Biological Motion and Nighttime Pedestrian Conspicuity. Human Factors, Vol. 36, No. 4, 1994, pp. 718, 732. -Pegrum, B.V. (1972), “The Application of Certain Traffic Management Techniques and Their Effect on Road Safety”. National Road Safety Symposium, March. -Polus, A., and A. Katz, (1978), “An Analysis of Nighttime Pedestrian Accidents at Specially Illuminated Crosswalks. Accident Analysis and Prevention, Vol. 10, No. 3, September. -Replogle, Michael, (1992), “Bicycle and Pedestrian Policies and Programs in Asia, Australia, and New Zealand. Case Study 17. National Bicycling and Walking Study. Report No. FHWA-PD-93-016. Federal Highway Administration. Washington, D.C., April­. -Schoon, C., and J. van Minnen, (1994), “The Safety of Roundabouts in the Netherlands. SWOV Institute for Road Safety Research. Traffic Engineering and Control. -Sisiopiku, V.P. and Akin, D., (2003), Pedestrian behaviors at and perceptions towards various pedestrian facilities: an examination based on observation and survey data. Transportation Research Part F: Traffic Psychology and Behavior, 6(4), pp.249-274. “The role of ambient light level in fatal crashes: Inferences from daylight saving time transitions. Accident Analysis and Prevention, 34(4), pp.487–498. -Troutbeck, R.J. (1993), “Capacity and Design of Roundabouts in Australia. Transportation Research Record 1398. TRB, National Research Council, Washington, D.C., pp. 68-74. -Van Houten, R., J. Malenfant, J. Van Houten, and R. Retting. Using Auditory Pedestrian Signals to Reduce Pedestrian and Vehicle Conflicts. Transportation Research Record 1578. TRB, National Research Council, Washington, D.C., 1997. -Van Houten, R., D. McCusker, S. Huybers, J.E.L. Malenfant, and D. Rice-Smith. Advance Yield Markings and Fluorescent Yellow Green Ra 4 Signs at Crosswalks with Uncontrolled Approaches. Transportation Research Record 1818. TRB, National Research Council, Washington, D.C., 2003, pp. 119-124. -Van Houten, R., and Malenfant, J.E.L. ITS Animated LED Signals Alert Drivers to Pedestrian Threats. ITE Journal, 71, 2001, pp. 42-47. -Van Houten, R., R.A. Retting, J. Van Houten, C.M. Farmer, and J.E.L. (1999b), “Malignant Use of Animation in LED Pedestrian Signals to Improve Pedestrian Safety”. ITE Journal, Vol. 69, pp. 30-38. -Walter, C. E. (1995), “Suburban Residential Traffic Calming”. ITE Journal, Vol. 65, No. 9, September, pp. 44-48. -Wood, J. M., Tyrrell, R. A., Chaparro, A., Marszalek, R., Carberry, T. R., & Chu, B. S. (2010), “Modest visual impairments and headlamp glare reduce pedestrian visibility at night”. Transportation Research Board Annual Meeting. -Xu, J., Ge, Y., Qu, W., Sun, X. and Zhang, K., (2018), “The mediating effect of traffic safety climate between pedestrian inconvenience and pedestrian behavior”. Accident Analysis & Prevention, 119, pp.155-161. -Zhang, Y., Mamun, S.A., Ivan, J.N., Ravishanker, N. and Haque, K., 2015. Safety effects of exclusive and concurrent signal phasing for pedestrian crossing. Accident Analysis & Prevention, 83, pp.26-36. -Zhuang, X., Wu, C. and Ma, S., (2018), “Cross or wait? Pedestrian decision making during clearance phase at signalized intersections”. Accident Analysis & Prevention, 111, pp.115-124. -Zegeer, C., J.H. Havens, and R. Deen, (1978), “Speed Reductions in School Zones. Transportation Research Record 597”. TRB, National Research Council, Washington, D.C. pp. 39-40. -Zegeer, C.V., J.R. Stewart, H.F. Huang, and P.A. Lagerwey­, (2002), “Safety Effects of Marked vs”. Unmarked Crosswalks at Uncontrolled Locations - Executive Summary and Recommended Guidelines. Report No. FHWA-RD-01-075. Federal Highway Administration, McLean, VA, March,http://www.walkinginfo.org/pdf/r&d/crosswalk_021302.pdf. -Zegeer, C.V., and M.J. Cynecki, (1986), “Methods of Increasing Pedestrian Safety at Right-Turn-on-Red Intersections”, Final Report. Report No. FHWA/IP-86/10, Federal Highway Administration, Washington, D.C.
-Zegeer, C.V., K.S. Opiela, and M.J. (1982), “Cynecki. Effect of Pedestrian Signals and Signal Timing on Pedestrian Accidents”. Transportation Research Record 847, TRB, National Research Council, Washington, D.C., pp. 62-72. -Zegeer, C.V., K.S. Opiela, and M.J. Cynecki. Pedestrian Signalization Alternatives. Report No. FHWA/RD-83/102. Federal Highway Administration, Washington, D.C., 1983.